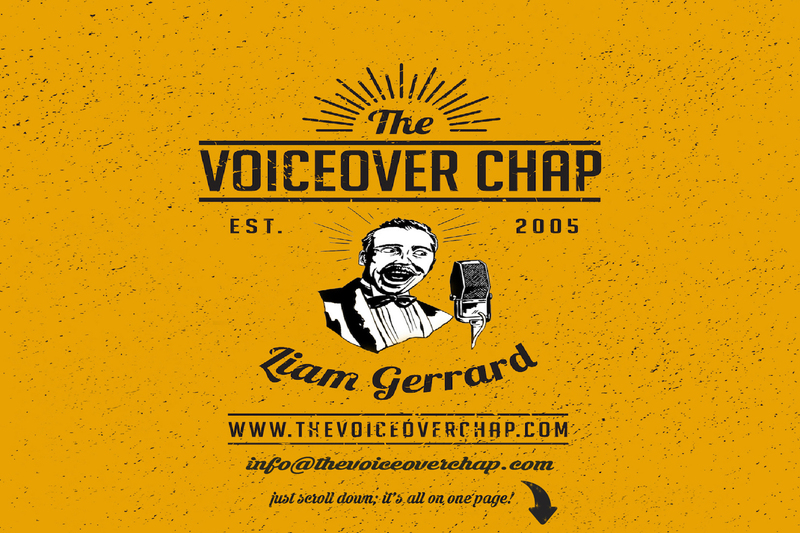 UK British English Male Voiceover | Liam Gerrard | The Voiceover Chap | – UK British voiceover artist Liam Gerrard – producing British voiceover in the studio every day. English voiceover specialising in commercials, corporate, E-Learning, imaging, IVR, video explainer, audiobooks and online. Have a look and get in touch, I'd love to work with you! Have a listen to some of my previous work! Hi! I’m Liam Gerrard; ‘The voiceover chap’. I’m a full-time professional voiceover artist and I’ve been working in the voice industry for over 10 years. I’ve recorded everything from audiobooks to corporate narration, e-learning to TV commercials, playing anyone and everyone from Queen Victoria to a crazy car driving frog! I also hold the position of Associate Lecturer in Broadcast Voice at Sheffield Hallam University; so I really do know what I’m ‘talking’ about! As well as being a classically trained actor I am also a musician, and have an acute understanding of pitch, tone, timbre, pace etc. This ensures I get exactly the right take required for you or your client, all in superfast turnaround time. Lancaster University and University of East Anglia. Based in central England my recording studio is easily accessible, and I also have a base in central London so can just as easily record in a studio of your choice. My client base reflects this attention to detail, and they are truly global, from Dublin to Dubai. Drop me a line, get in touch and say hi! Liam has recorded parts which feature across our new product. He has recorded in a variety of native English and international accents, his voice adapting very well to the different roles and always capturing feeling and authenticity. As well as having a great voice, Liam is supportive, responsive and a pleasure to work with. Thank you Liam! Take a look at my work on video - updated regularly! 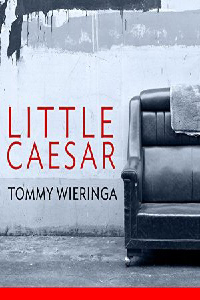 Just released on Audible; the award winning ’Little Caesar’ by Tommy Wieringa, narrated by me. Keep checking back for more updates on my latest work and releases! Just released on Audible, the brand new ’Deception of a Highlander’ audiobook series recorded by me; by Madeline Martin. Liam invests a lot of time to get it just right. Great to work with! In my professional studio I will record and deliver your project in any format, in super-quick turnaround time; and I offer same day retakes to ensure you are 100% satisfied with the end product. I have recorded thousands of projects, and have a wealth of experience in delivering copy material. I can write your copy for your project or, if you prefer I can edit it with you so it flows in the way you intend to your end-user. I fully edit all work as standard including limiting, mastering, eq-ing, and processing. I can handle all post-production deliver to your end-client. I also provide edit-only services; get in touch! As a professional musician, and one who works with many other professional recording artists I can write and produce music and SFX to suit your project. I can even edit and add your own choice of music to your project, saving you on editing costs! My professional studio is based in central England, however I also have a base in London and can easily travel to a studio in the capital, or anywhere in the country of your choice. I work with many other voice-artists on a regular basis, so if there’s a particular type of voice you’re after, gender, age or a particular native accent get in touch as I will source and provide the exact voice required for your project! Delivery in multiple formats, from WAV to mp3; through ftp, box, ISDN, ipDTL, Source Connect and many others. Your preferred file format and method of delivery is my objection. I write, produce record, edit and deliver voice-reels for actors; specialising in agency reels, commercial reels, corporate reels and radio drama reels. Prices start at £250 for a full bespoke service. Drop me a line to find out more! Corporate example rates £150 + VAT BSF - per hour Includes recording, basic editing and supply in any format of your choice within 24 hours. All prices vary on project, but this is a rough guide. Do get in touch for a more accurate figure! It is very difficult to give a set rate, as all rates vary depending on the type of project, audience, amount of time taken to record and how much processing, mastering and editing is needed. It would be impractical to charge the same to a low budget startup with a release to 50 people in the local area, as to a an open ended worldwide television campaign for a multinational corporation. However, the figures opposite are a very rough guide to reflect my Basic Studio Fee. These fees will be subject to negotiation and buyouts, where appropriate. Do get in touch to discuss rates, I’m sure you will be pleasantly surprised as I’m very interested in fostering long term client relations than quick buck turnarounds. So don’t worry if your budget is small I’m sure we can come to a happy compromise. I work with you, for you, to your budget. Drop me a line and get in touch here. If you have any queries or want to discuss costings for your project don’t hesitate to get in touch or email me at info@thevoiceoverchap.com. I’ll get back to you as soon as I can.